Who to make as my next project? The leveling process. Duelist Barclay level 80 (2/3) - being a blue card he is relatively easy to level up and I am close to a Daystrom collection bonus. David Marcus level 90 (3/4) - again for the daystrom collection bonus this would be good to get done and out of the way. Tuskegee Mayweather 70 (3/4) - with Niners Rom in cryo I probably should aim to level up Mayweather soon and it may lead to cryo Drone Seven to free up space. First Goran Agar level 90 (2/4) - hedging my bets on this one, he was quite easy for me to level this far, DS9 event is coming up and he has high CMD base that might find use on shuttles. RAF Bashir level 80 (3/4) - well he's augment, DS9 main cast and 3/4 plus has reasonable base stats for shuttles. So who would you prioritise? I would prioritize Sela (her stats are rubbish but at least she can be vaulted) and Commander Kira as shes a pretty decent 5* (and easy on the eye). RAF Bashir is useful as MED crew so I would put him down as third. I agree that Sela should be first just because she the only FF on this list. Also, she has the Romulan trait which, for collections, is rare. If you don't need her, freeze her. 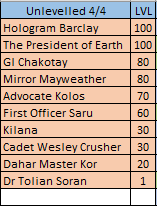 After that, I'd first level Commander Kira because she's got great stats for voyages and shuttles, then Tuskegee Mayweather for his engineering stats, and Kazon Seska I think should be higher on the priority list. However, this is just general advice. Depending on the stats that you are low on in your crew should determine who you level. Also, eventually you'll get extra copies of all of these crew to FF them and that will push them higher on the priority list as well. "I would have told him anything. Anything at all. But more than that, I believed that I could see...five lights." 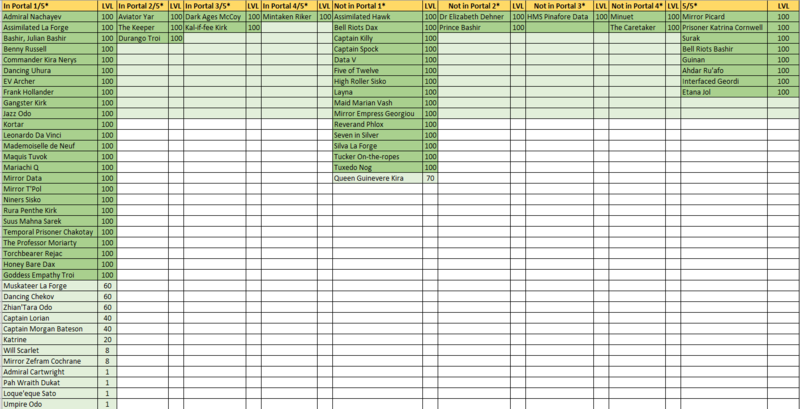 Link to my list of helpful spreadsheets, websites, threads, and help for all players! Mariachi Q - Déjà Q Quote - But I feel like celebrating! - Thank You! H.M.S. Pinafore Data - Insurrection Quote - And his fist be ever ready for a knockdown blow. - Thank You! Rascal Picard/Guinan - Rascals Quote - I want to see my father! Kivas Fajo - The Most Toys Quote - What a marvelous contradiction. A military pacifist! Batai - The Inner Light Quote - This tree is our symbol. Our affirmation of life. Irumodic Syndrome Picard - All Good Things Quote - You said it was earl grey. I'd swear it was darjeeling. - Thank You! B-4 - Nemesis Quote - Why do you have a shiny head? - Thank You! Zero G Worf - First Contact Quote - Assimilate this! yeah I guess I should bite the bullet and stop procrastinating on Sela, thanks for your suggestions. Yeah ... get Sela up and frozen ... then get Duelist Barclay to 100, he'll come up in Voyages or portal pulls for sure and the second he does freeze him. After that ... the next Mega-event is still a bit off to full on go for DS9/Augment crew ... a 5* is a nice project to work alongside what you're currently doing (e.g. I'm levelling up Age of Sail Riker together with Edith Keeler and Laas) ... but I'd kinda play it by event notice, on Friday we'll get notice of the next weekend's event so then you can maybe focus and prioritise a bit more. Also, don't forget any new crew coming in from this weekend's event (Rule 125). 6. if no one ... any 3/4 starting with Tuskegee Mayweather. I imagine you've seen it by now, but Duelist Barclay is a daily log-in award this month, so you'll have him FF on Thursday. Finish and freeze. And I concur with everyone else - Sela is begging you to send her to the vault. After that, I'd focus on your DS9/Augment crowd since you know they'll have value soon. I have it made up for losing Bridge officer Troi from the rewards. Sela is up to 100 just need a few more items but ugh man those green imperial icons i just need about 5 of those to finish her off. so now I am on to Barclay except ugh ancient film lol. I would finish off Commander Kira Nerys, because even at 1/5, her CMD base is almeowst a thousand. Interspersed amongst the above, on the relatively rare occasions when I do get a new Legendary crew member, I will generally try to get them FE sooner rather than later. Sigh is it normal to run 12 shuttle missions and still not get a single green imperial Icon? Assuming you are referring to the 2* Star Empire Icon, in the future you may want to consider farming it on Tuesdays and Sundays from Cadet Challenges (Mission UF-M2). I realize the timing for this is not ideal for you now, with it being Wednesday today. Sadly, yes. I thought I would walk away from last month's mega-event with a nice stockpile, but alas, no. Come join the Steeler Nation Fleet! TBH as I have Vic, Mirror Geordi, Talos IV Spock I don't think I am going to get a lot of mileage out of these options, and will probably be a chroniton waste in a way. CMD seems to be the only improvement I can probably make for the galaxy event. Mariachi Q (1/5) 90 - DIP is covered with Vic - SEC might be a slight improvement. Ambassador Spock (2/4) 30 - had my fill of Romulan/Vulcan for now, and Mirror Geordi or Vic will probably be better options. Holonovel Doctor 1/4 level 1 - Covered by Vic or Geordi. Sail La Forge, Odo and Q are useful outside of event (well, La Forge need another star or two). There are also skill pairs, so I wouldn't discard Holonovel Doctor with his Sci/Med... He's easy to level too. Thanks al103, yes if I can help it I don't intend on air-locking anyone of these if I can help it. I think Q is a good one to do as he is one of the closest to being FE out of my Legendaries on the to do list. I mean discard from priority leveling, not airlock. So does anyone have any suggestions who first. I've predicted that next week's event will be a re-run of Endgame ... so, I'd level Cadet Wesley Crusher who might be helpful, even though it is a Galaxy event ... we'll know in a couple of hours though. - I have Z. Odo at 1/5 FE and he gets a lot of work done through DIP seats on shuttles. But what is really handy is that he frees up my top DIP crew for Voyages. - Will Scarlett is not worth it for Gauntlet, Aviator Yar is almost at the same SEC level, and has 3 skills. 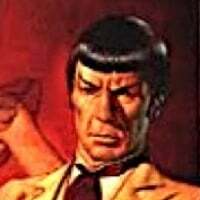 Romulan Kirk (4*) is another option to use there. I have Will 2/5 and never use him for anything other than Worf events, he has my second best SEC proficiency, behind Augment Commander O'Brien (who at 1/5 has a way better base and so is sometimes used). - My 1/5 Dancing Chekov does see the odd Voyage, so there's an option. Especially during crew heavy Faction events, where Chekov is fine 2nd tier crew for voyages. Personally, I'd just work my way down the list with one 4/4 and one 1/5 at the same time, working on crew I liked (Mirror Mayweather, Saru, Bateson, Katrine) and then add in the odd event related that you've not levelled. EDIT: --> All effort on Z. Odo (due to next event), not a bad option either way. So Waitress Ezri has me in a bit of a quandary, a *5 bonus would put her MED skill between Cornwell and Bashir at 1/4 FE. However if traits match would that also increase the success % chance - how is it actually calculated? Of course if the Med and Dip feature as a build then Waitress Ezri might well be useful even at 1/4. So do you think she is she worth levelling, on the plus side I do already have her at Level 80? And actually on further thinking I do have Sniper Ezri Dax immortalised this might be the rare occurrence that a blue is actually useful for an event. Do you think Waitress Ezri is worth leveling I am in two minds I will have to level Incognito Kirk or 1701 Dax (not sure which one will be the reward presuming it's Kirk) from scratch so that I need to take in to consideration, I also haven't yet decided whether to go for L'Rell or not. On the plus side she would make the occasional gauntlet as well I suppose. It might be worth focusing first on Incognito? The new Super Rares have had very good skill scores; 1701's bases and voyage totals are not great. Incognito seems like he would be more likely to be immediately useful outside of the event. It is also probably safe to assume that Incognito will have some CMD, so if you don't have Braxton that would be important. If you can do both then I would say 1701 next since she will have high bonus. 1701 then gives you his secondary ENG skill as well as her SCI. Then I would say which small bonus crew do you have available that might provide DIP or SEC. It might be safe to assume that MED won't be a crit bonus since very few possible bonus crew have it. But going past 1701 might not be worth it if it consumes chrons needed for the event. Starting from scratch it looks like Waitress Ezri would take 6509 chrons, probably most at her higher levels, which is alot to take away from the event for a small chance of a slightly better crit bonus. You'll get both Kirk and Dax through community rewards in Phase 1 ... and depending on how dedicated you are in the beginning, you might even get them in through community reward before you get the threshold 4*. - 1701 Dax has a 569 base SCI (for me 643 with starbase/collection bonuses) so that is actually not bad for a 1/4. Might be worth levelling during the event, especially if you don't have many of the associated event crew. - Waitress Ezri ... I don't know, it really is trait dependent there ... I have her 3/4 FE, but don't expect to use her much ... for DIP I have other crew that are better (Z. Odo comes to mind!) and will her MED be better than non-event crew? Uncertain. Her lvl 80-100 items are not that difficult ... also knowing that you don't have to equip the lvl 99 item really (adds SEC base and MED roll) or her lvl 90 disguise (DIP roll) might help. So just getting her to 100 should be a breeze. I've never used her in the Gauntlet, so can't tell you how good she is there ... just roll out the standard 5 every 2 days (not really a Gauntlet aficionado) ... never look at bonuses. - I'm not sure how percentages are calculated, but I always double the base score for associated event crew and triple those of specific event crew to see where they fall within my total crew. I know Factions work like this, but Galaxy I'm not sure. So 1701 Dax would be 1929 SCI for me ... normally only 5* Surak has a better base than that ... but I have other event-crew that have good SCI scores too (Princess 997*2, Honey Bare 898*2, K'mtar 876*2 ...) that might get trait bonuses. - L'Rell worth it? ... I'd like to hope so, a Klingon and a Discovery character ... that has to be of use sometime no? We'll see later today what the stats are ... personally, I'm going to see if I can got top 1500 ... I'm not too worried about getting a 1/5 in that I might not use much. If I look at your 5* list I'm jealous, so much more/better crew than I have at my disposal. I guess you don't need another 1/5 hanging around. I guess I am at a stage where I am starting to stockpile chrons in the thousands not the outrageous amounts I see from some still sub 10k. But I could easily see them frittered away in a galaxy and I suspect Event 1 of the mega might be a faction/hybrid. Last mega I burnt a little bit too much beforehand and didn't have much reserves. I didn't realise I had so many holograms unlevelled. Another part of me is conscientious of the increasing number of 1/5s so another little bottleneck to be mindful of. Not to mention choosing who next to cite now that I have finished the Caretaker last week (save next mega legendary maybe). Ok I did win Braxton and he is ranked number 1 so yes he'll be next. I wouldn't mind L'Rell as I do seem to have a good stash of Klingon Items, I was able to FE Civil war Worf at virtually no chroniton consumption during the Skirmish event. I have to say I am happy with the crew I have so far acquired. There was a time when I was complaining that I didn't have good SEC then Durango Troi and Rura Penthe Kirk fell in my lap in consecutive weeks and then I won High Roller Sisko. In short I think this means hang tight on leveling Waitress Dax, unless I can rep/adwarp her up at no detriment. - 6 0* Databases - all used in a 4* Diplomatic Protocol ... an item I sometimes replicate completely due to irritating components (Holoprograms), or at least the 3* Champagne needed (would still require 6 Databases). (15 chronitons worth). - 8 0* Clothing Patterns (20 chronitons). oh yes and NB I did finish Odo during the Skirmish or shortly thereafter. Ahh, good catch. Ignore previous comment then Glad I'm not the only one who settles for synthaol champagne, too!